The Home Ed Voices Podcast is a UK-based Home Education Podcast that profiles the lives of home ed families. You can find out more about the podcast here. This week I am talking with Leah Boden from Modern Miss Mason. We talk about her work, encouraging home educating and homeschooling parents to adapt the ideas of Charlotte Mason for the modern era we live in today. We talk about how living in the UK means that we get to live amongst living history, and we discuss the importance of prioritizing home education, and balancing our other projects alongside it. Calling all crafters – with Christmas fast approaching, it’s time to think about making things for our loved ones, or finding a special something for the knitter or crocheter in your life. If you fancy the double whammy of finding beautiful, British hand dyed wool, and supporting this podcast at the same time then check out OxfordKitchenYarns at OxfordKitchenYarns.com. As OxfordKitchenYarns I have been dyeing British wool since 2007, and as Home Ed Voices Podcast listeners you can get 15% off your order by using the discount code ‘HOMEEDVOICES‘ at checkout. Know that you are supporting British sheep farmers and wool mills, as well as my home educating family. You can find Leah at Modernmmissmason.com or on instagram or facebook. Follow HomeEdVoicesPodcast on Instagram, Twitter, and Pinterest, or join my newsletter. If you have any questions or can think of someone you would like me to interview on the podcast, please get in touch via the comments below. 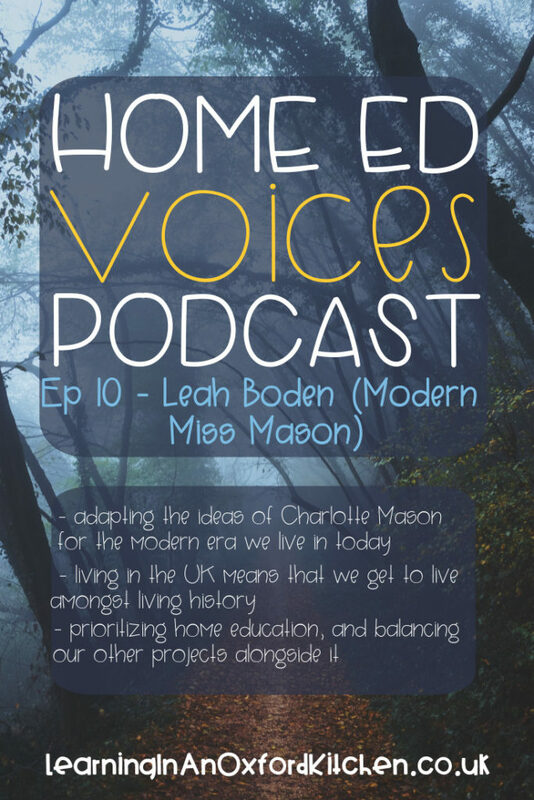 If you enjoyed the podcast and know someone who might benefit from listening to a Home Education Podcast, please let them know about the Home Ed Voices Podcast. Thank you! Although I consider our family to be eclectic home educators, there are plenty of things that we do that could be considered to be a bit Charlotte Mason-y. For example I am a big fan of short lessons, and our table work is made up of a series of them, covering key skill areas including maths, spelling, reading practice, grammar, sight words etc. We also do a lot of learning through stories and living books, and though I don’t think I could get through the amount of readalouds that some CM families do (covering 3 or 4 subjects every day for example), I have been adding daytime readalouds alongside the reading we do at bedtime. The difficulty is that a lot of the Charlotte Mason book lists are US centric, not only in history, but also in their choices of nature study authors. So I have been researching which of the vintage authors are/were British to make sure that we are learning about things that are directly relevant to our day to day lives. Arabella Buckley is a fantastic example of an author of living books that Britain-based home educators can use. She was a naturalist and scientist who wrote extensively for children, in a chatty, clear way. 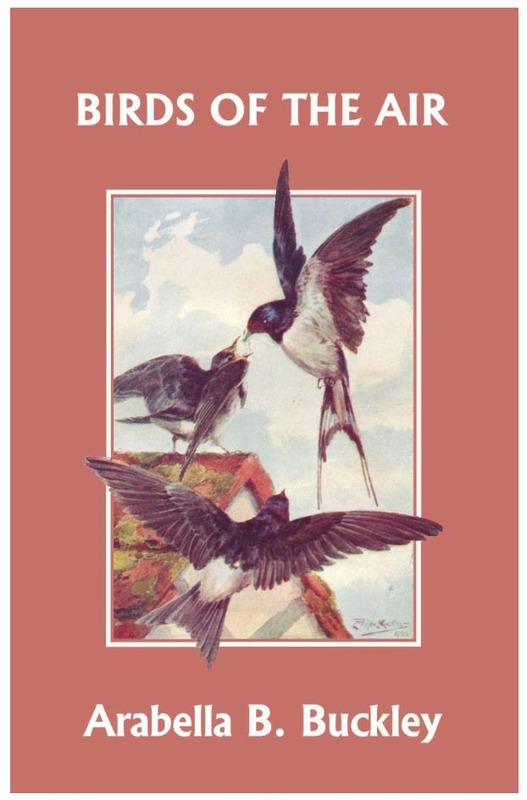 We are currently reading ‘Birds of the Air’ originally published in 1901, and it is as relevant now as it has ever been. And her books are easy to get hold of at low cost, assuming you are willing to use digital copies. Two of her books (The Fairy Land of Science, and Through Magic Glasses and other Lectures) are available via gutenberg.org in various digital formats at no cost. Others are available at Yesterday’s Classics and amazon.co.uk for less than £3/$3 per book. We are planning to read a number of her books this year and next, so I’ll let you know what I think of them as we get more familiar with her work.